Over the past few days it’s been Coachella overload! With constant Twitter, Facebook, Lookbook, Tumblr and Chictopia updates on looks and outfits seen at the festival, it’s inspired me to do my own post. I would love to go to Coachella at least once in my lifetime simply for the Fashion! Forgive me for not having an enthusiastic love for Music, I’m sure the tunage is great there but for me, it’s all about the threads. 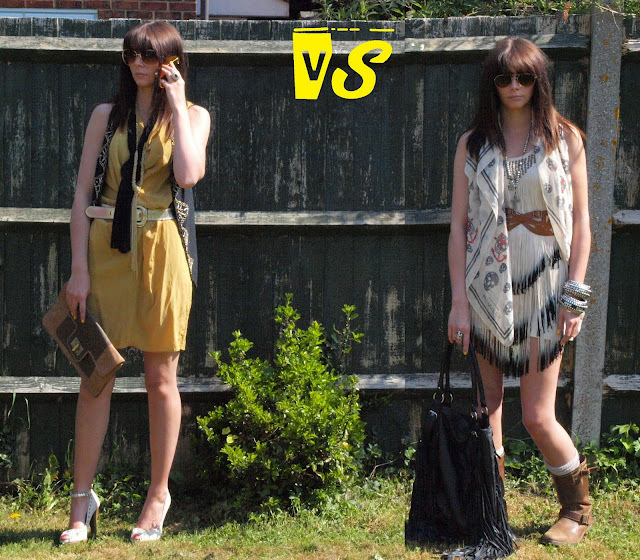 The huge US festival really does rival our cult ‘Glasto’ mecca, but which eclectic style do you prefer? These are my interpretations of the two styles, which one are you? Dress: Warehouse. Waistcoat: Primark. Clutch Bag: Warehouse. Black Fabric Necklace: H&M. Gold Necklace: H&M. Belt: Fendi. Sunglasses: New Look. Anklet: Accessorize. Shoes: Bershka. Dress: Topshop. Bag: Topshop. Boots: Fryre. Scarf: Alexander McQueen. Necklace: Topshop. Sunglasses: Ralph Lauren Polo. Belt: Bershka. Socks: River Island. Ring: Dorothy Perkins. Bangles: Primark.